Peyronie’s disease can substantially impact a man’s relationship with his partner. Communication is essential to help any relationship thrive, but it is especially important with Peyronie’s disease. Ongoing conversations about the physical and emotional aspects of the disease are crucial parts of that communication. It can be difficult to have a conversation with your partner about Peyronie’s disease. These approaches may help. Don’t talk about everything in one conversation. Revisit topics as your feelings or symptoms change. Describe to your partner what Peyronie’s disease is. Explain how Peyronie’s disease affects you — physically, emotionally, and sexually. Ask about and listen to your partner’s feelings and fears about the disease and your relationship. Talk about ways to maintain or enhance your emotional, physical, and sexual intimacy. Involve your partner as you learn more about the disease and its treatment. Ask your partner to go with you to doctor’s appointments. 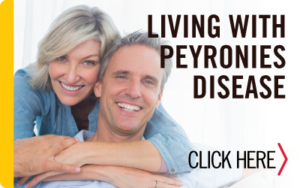 Learn more about how Peyronie’s disease impacts your relationship.